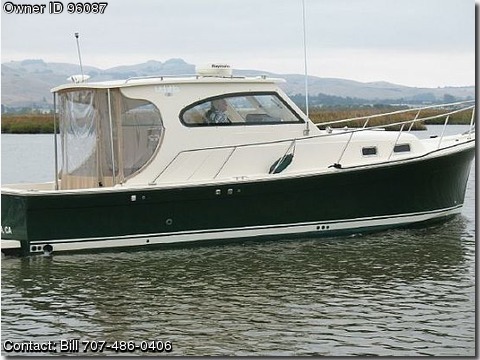 Contact the owner Bill @ 707-486-0406 with any questions.This down east design has great dock appeal, performance and comfort. Her 315hp Yanmar diesel engine is frugal with fuel consumption at trawler speeds and can move along at 20 knots when more throttle is desired. Accommodations: Entering through the transom door is a large cockpit that leads you to the helm station. The main cabin entry is through a sliding door that opens in to a beautifully appointed salon with cherry wood throughout and 6'3" headroom. The galley is to port of the companionway and the enclosed head is across to starboard. Moving forward is a full-width U-shaped settee with a versatile drop-leaf table that sets up to seat four and then tucks neatly away to make room for the queen-sized berth. This vessel comes with a Flat-screen TV and a air conditioner/heater system. Galley: •GS 12 volt Refer (Top Load) •Kenyon Single Burner Electric Stove •Tappan Microwave Oven •Waterheater •Pressurized Hot & Cold Water. Electronics/Electrical: •Raymarine Smart Pilot •4" Danforth Compass •Raymarine 24 Mile Radar •Rudder Angle Indicator •Raymarine Color GPS Chart Plotter •Raymarine Depth •Raymarine Speed •Raymarine VHF Radio •Hand Held VHF Radio •Raymarine Dual Screen 600 Fishfinder •3.5 KW Marrkon Genset •30 Amp Power Inlet •12 Volt DC & 110 Volt AC Systems •Battery Charger •2 Group 27 Engine Batteries •2 Group 27 House Batteries •2 Group 27 Bow Thruster Batteries. Deck: •SS Hand Rails •Walkaround decks •22 lb. Bruce Anchor •150' Anchor Chain & 150' Nylon Rode •Spare Claw Anchor •Life Sling •Hand-Hold for Boarding Gate •Simpson-Lawrence Electric Windlass •Windlass Controls Deck & Helm •ACR RCL100 Spotlight.